Covered in solar panels, with a wind turbine spinning above and geothermal wells pumping below, Staten Island's newest public school is an icon of energy efficiency. But officials at Public School 62, which opened today in New York City's fifth borough, say they hope that most of the energy savings will be due to what happens inside the school—by teaching kids about going green and encouraging people to conserve. The school, which was designed by the prestigious architecture firm Skidmore, Owings & Merrill, is a net contributor of energy, which means that it actually sends electricity back to the grid. It's the first net-zero energy school east of the Mississippi, according to the architects, and it's one of only a few buildings in the country that manages to be sustainable even while operating on a longer-than-9-to-5 schedule. "All buildings should aspire to these kinds of levels to ensure our planet's future," said Roger Duffy, an architect at SOM. Lisa Sarnicola, the new school's principal, told me that the first day was a success. "The building itself is absolutely beautiful—there's so much natural light, it's so clean," she said. "I think it’s just a great environment for students and teachers to learn and work in." The school currently has just over 90 kids—75 in three kindergarten classes, and 18 in one pre-kindergarten class. Each year, it will add another grade, eventually serving 440 students from pre-K to grade 5. The curriculum itself will focus on sustainability, with teachers integrating it into their classes. "We’re going to be learning about energy conservation, and how we as little people can make a big difference at helping preserve our world," Sarnicola said. The building itself will be part of that learning. Monitors in every hallway will show students how much energy they've used and saved, and there will be competitions between different classes to see who can save the most. There'll be a small gym with stationary bikes, and students can pedal to create more energy. Students and parents can check the consumption in real time on an app. Duffy said the building's energy savings aren't just from the solar panels, geothermal wells, or wind turbine. About half of the energy the engineers expect to save comes instead from little design decisions, like designing hallways that are skylit even on the ground floor. 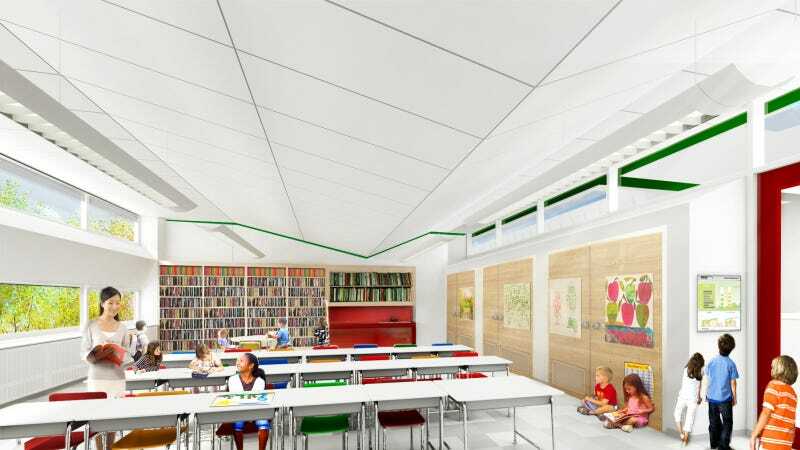 In some parts of the building, 90% of the light classrooms need will be harvested from sunlight. "You don't really need to turn the lights on," Duffy said. Architects met with teachers to discuss their typical schedule and how they interacted with their space. They're hoping to change peoples' behavior to be more sustainable. For example, they realized that designing an attractive teacher's lounge could encourage teachers not to use a separate coffeemaker for their own classroom, for example. "It went beyond the typical role of an architect and engineer to finding out how people actually use the space, so we can figure out how to use it more efficiently," Duffy said. The building isn't totally finished—there's some exterior work yet to be done, and the greenhouse vegetable garden, where students will help grow vegetables that will be used in the cafeteria, is still in progress. While the building cost more than a typical school, Duffy says he thinks it could have a positive impact on the city budget overall. "The city operates 130 million square feet of schools," he said. "If we learn lessons from this building about saving energy that can be applied across the system… even if we can improve the energy efficiency of 2 to 5%, that's could create huge cost savings for the system."